This week’s warm weather brought memories of a day hike last summer during similar conditions. As has been my habit, I didn’t bring enough water for the day, and by the time we were halfway through our hike, my water bottle was empty. And has been my habit over many years, I ended up desperately scooping water from lakes and streams. 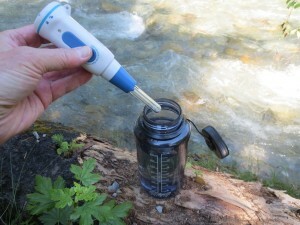 I’ve never suffered any ill effects from drinking directly from backcountry water sources, despite warnings by parks and health officials for the past three decades. But this year, I decided to allow a little technology into my life and insure that I don’t run afoul of the dreaded giardiasis or some other parasite. 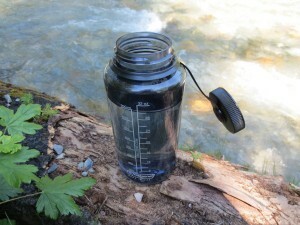 One of the reasons I’ve drunk freely from mountain streams is an aversion to the alternatives: carrying a litre or more of tepid water in my pack; dissolving various tablets in my water bottle that aren’t effective against all organisms or affect the taste of the water; pumping away with fussy and often bulky water filters. I know, there are fans of all of these and others, but I’ve settled on a SteriPEN—a small, lightweight device that emits shortwave ultraviolet light to disinfect water. You immerse a fluorescent-like tube in your water bottle, stir it around for 45 to 90 seconds (depending on the amount of water), and, voilà, pure drinking water. 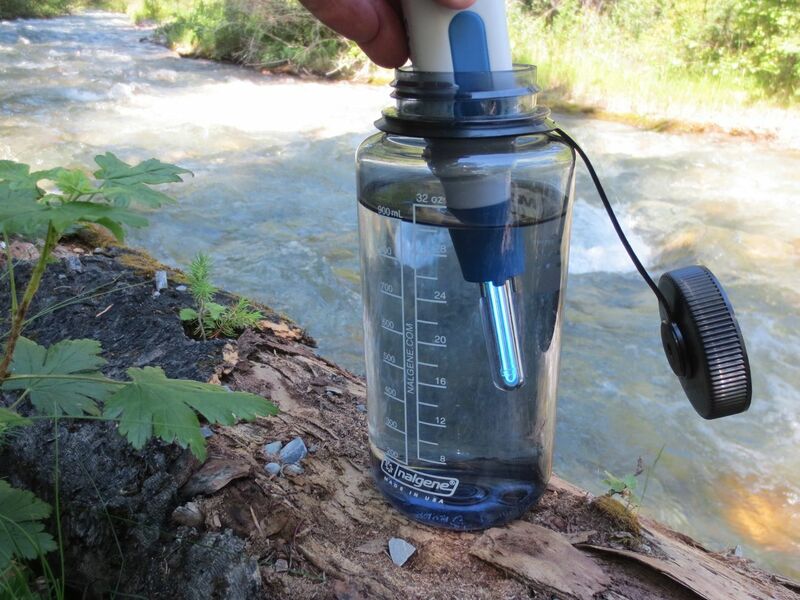 SteriPen isn’t effective in turbid water, but that’s hardly ever a problem in the Canadian Rockies. And I suppose I like the idea of scooping and drinking from streams with minimal fuss. And by scooping more often and treating smaller amounts (500ml), I don’t need to carry a weighty water bottle all day just so I can drink tepid water; I can still drink cold, fresh mountain water. Some people worry about the water that collects on the rim of the drinking bottle when you dip it in the stream (it won’t receive treatment), but while there are fussy ways of getting water into your bottle without wetting the rim, I prefer to simply wipe the rim dry with a cloth. That’s good enough for the people I run with. There are several SteriPen models, some that weigh a bit more than others. I have the “Classic” model, which is the heaviest at 185g with its four AA batteries (lithium disposable or NiMH rechargeable). The lightest, the “Adventurer Opti,” only weighs 103g but uses rather exotic batteries that could be difficult to find. SteriPen cons? More technology in my pack that is battery-dependent. And you should carry an extra set of batteries with you to insure you aren’t left high and dry. What about backpacking? The best means of purifying larger amounts of water in the backcountry is still boiling, but I will still take my SteriPen along for general drinking purposes. I know there are a lot of people out there who prefer to stay hydrated by other means and dislike relying on this sort of technology. I accept their opinions. But the SteriPen is as close as I can come to scooping and drinking, so I’ll use it as long as it provides that convenience. For a good overview on water purification, check out “Backcountry Water Treatment” on the MEC (Mountain Equipment Co-op) website.